Wil's older brother had asthma, which is what left him dead. Wil and his parents aren't sure what to do now, how to go on living. 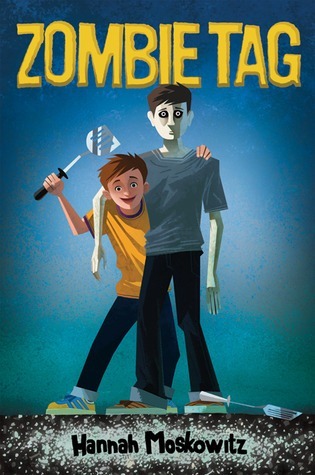 So Wil starts playing Zombie Tag, a fun game that helps temporarily keep his mind off his dead older brother. That is until he finds a way to bring back all the dead in a 5 mile radius. So his brother comes back, but is now a zombie and not the same brother as before. Leave it to Hannah Moskowitz to turn zombies into a touching story. Wil not only has to deal with his brother's death, but also his reanimation and subsequent emotionless state. This was an excellent story about zombies and grief. I liked that is had a light feel to it while dealing with the issues, that way you don't get too depressed. Wil was an interesting character and I loved being inside his head. He has that impulsive quality about him where you know he's bound to get in trouble but will try to find his way out of it. I definitely recommend this for kids who are going through death of a loved one, it might make them laugh and also help them realize that death isn't always a bad thing. At the very least, maybe a game of Zombie Tag will lighten their mood a bit. Another great novel by Moskowitz, period. "I only invented Zombie Tag three weeks ago, and we've already lost seven spatulas." "Maybe he's just pretending that he doesn't have feelings, because it's easier. Maybe it's way easier not to love me."